← Is there a PERS tax on my home? Comparing Oregon to other states helps us understand and communicate how prosperous the State of Oregon government actually is. We also included regulations as they are a different form of taxation because government gets to achieve a goal for free but at a significant expense to a small business or a taxpayer family budget. #5 STATE SPENDING: Oregon state spending per person is the 5th highest in the nation, outpacing the national average by more the 55 percent, according to the Kaiser Family Foundation. Over the same time period, personal income in Oregon was 8 percent lower than the national average. As government gets bigger, our paychecks shrink. 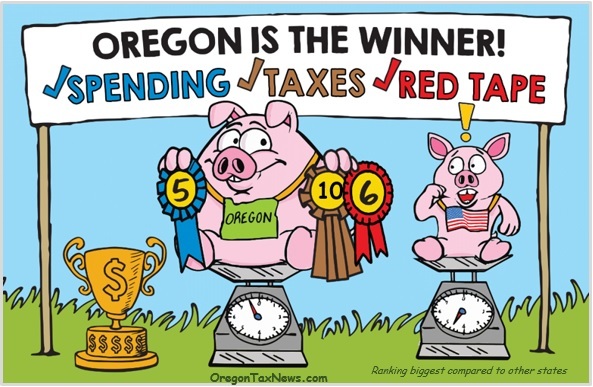 #10 STATE TAXES: Oregon ranks as the 10th biggest tax state in the nation according to the Tax Foundation’s annual State Business Tax Climate Index 2018. #6 RED TAPE REGULATIONS: According to the Mercatus Center, Oregon has the sixth highest number of state regulatory restrictions in the country with more than 167,000 restrictions on the books.